Interesting tasting today of Bordeaux reds and whites from left bank appellation Pessac-Leognan. The en primeur vintage of 2012 was on show with either 2009 or 2010 along side for comparison. Whites in general the 2012s were fresh, clean and compared favourably with the 2009s. The 2010s had the more body and substance but were different animals. I really liked the 12s that had enough fruit to counter the high acidity. For the reds 2010 was all structure and seriousness and 2009 rounded and all come hither conforming to stereotype. However many of the 2012 were pretty good too. Stand out whites were: Malartic-Lagraviere both 10 and 12 and Chateau de Fieuzal again both 09 & 12. Other wines that showed well included Ch de France 12, Ch La Garde, Ch Couhins (Graves) 12 (100% Sauv blanc), Dom de Chevalier 12 & Ch Bouscaut 11 & 12. 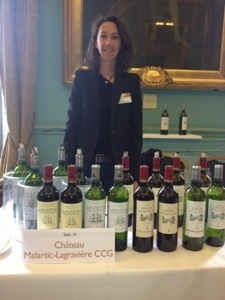 Reds that wowed included funnily enough Malartic-Lagraviere and Chateau de Fieuzal again, then Dom de Chevalier. Categories: Everything else, tasting notes | Tags: Bordeaux; Pessac-Leognan; Sauvignon blanc; cabernet sauvignon | Permalink.